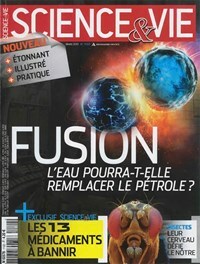 The energy "that could change the face of the world"
The French popular science magazine ''Science et Vie'' features an 18-page story on fusion in its March issue. Unfortunately, it is not available online. Everything you always wanted to know about fusion, or close to, is in this month's issue of the accessible French science magazine Science et Vie (circulation 280,000). Under the headline "Will water replace oil one day?" the magazine devotes 18 pages to nuclear fusion, which it presents as "an energy source that—once harnessed—would change the face of the world." "In four words: clean, safe, peaceful and unlimited," writes journalist Vincent Nouyrigat, "fusion energy offers the most beautiful promise ever made to mankind." Illustrated with images, diagrams and artists' renderings, the article covers most aspects of the challenge of fusion, from plasma stabilization to material resistance and fuel production. The 18-page story opens with ITER, described as "the first step in the monumental stairway" leading to the industrialization of fusion energy. The article provides the lay public with a panoramic view of fusion research today, including insights into stellarators, inertial fusion, Sandia's Z-machine and fusion hybrids.